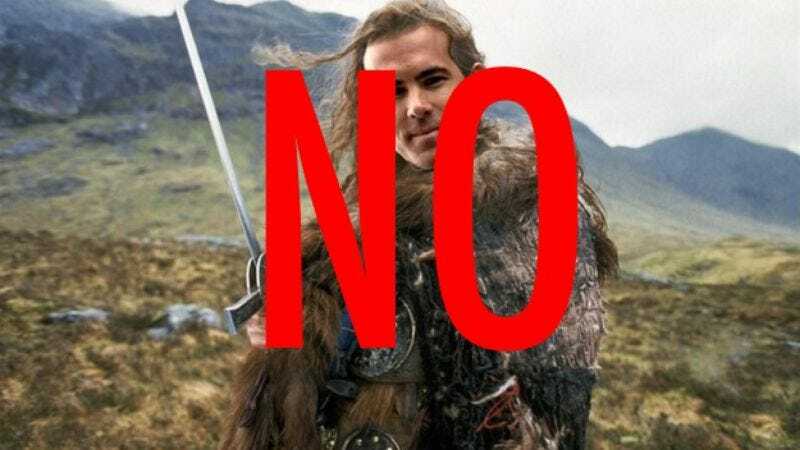 Once more totally disregarding the film’s popular tagline, “There can be only one guy who should be played by Ryan Reynolds, given that we are afraid of actual Scottish people,” the Highlander reboot has lost erstwhile star Ryan Reynolds. The Wrap reports that the actor has exited the long-gestating film for unspecified reasons, but which likely have to do with watching the attempts of so many writers and directors wither and perish around him—and all the while Reynolds is bound by destiny to just keep going while listening to whatever the modern equivalent of a sad Queen song is, like maybe something by Muse. Reynolds’ exit follows that of Juan Carlos Fresnadillo, leaving producers Neal Moritz and Peter Davis once again looking for a new director and star to take on their tragically immortal project. It cannot die. Accept it.